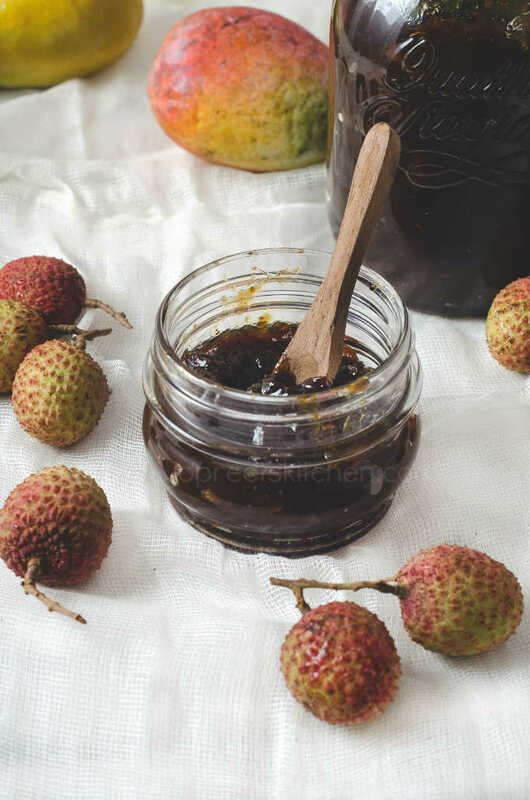 Spiced Mango, Kiwi & Litchi Jam / How to prepare Jam at home without using Pectin, I’m sharing an easy, healthy and yummy jam recipe which is also vegan. I have used the combination of three fruits (Mango, Kiwi & Litchi). Instead of sugar, I have used palm jaggery. Lemon acts as preservative here along with other spices used. 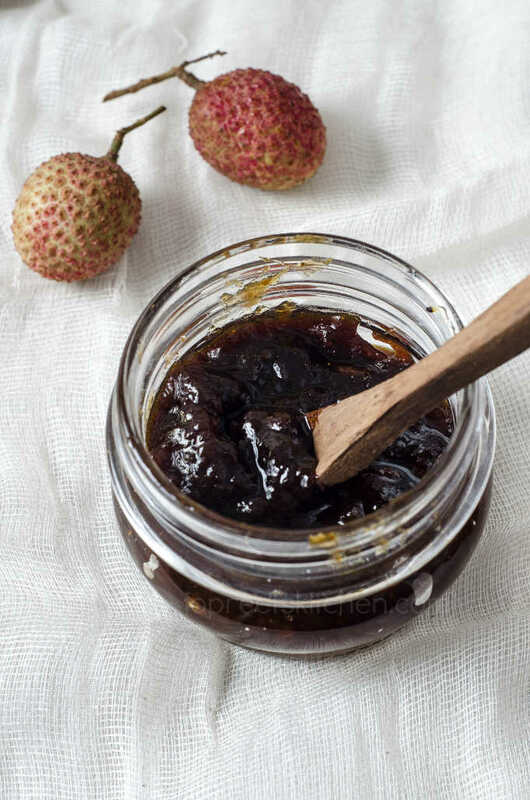 To increase the shelf life of jam, store it in an sterilized jar. To sterilize, wash jar / bottle. Remove the lids and boil the jar in a vessel with lid side up for 10-15 mins. Remove them carefully with the help of tong. And clean them using neat kitchen towel. Put the lids in the same hot water for 5 mins and remove them. Store the jam in jar / bottle and keep it at room temperature. You can also keep in refrigerator which will increase the shelf life to one year. But make sure there is no water / moisture in jar or jam. The below mentioned quantity yields 680 ml Jam. 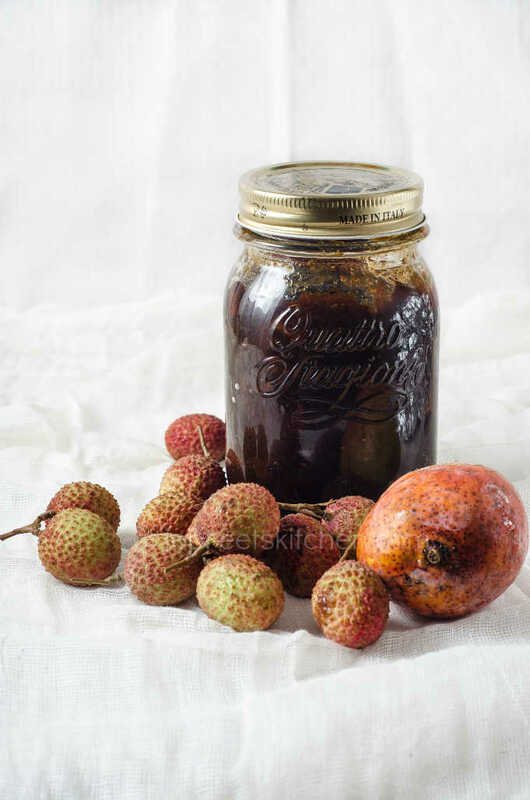 Use pulpy mangoes to prepare this jam. Those who doesn’t like to add jaggery, can replace with sugar. I have not used any chemical preservatives. 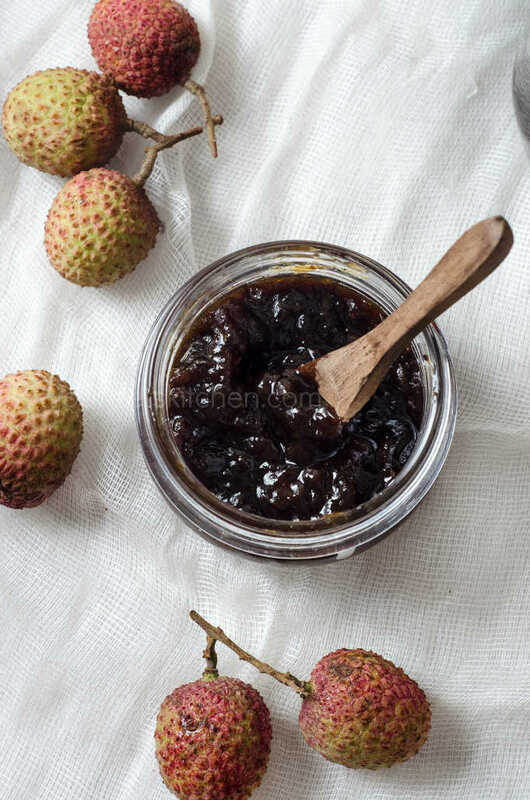 The color of jam is dark brown due to palm jaggery. Do try this jam and share your feedback with us. Wash mango and peel off the skin. Chop mango into small pieces and keep aside. Similarly, peel and chop kiwi & litchi. Mix all the fruits together. Heat powdered jaggery and mixed fruits together in a non-stick pan. Keep on low-medium flame. Add cloves, cinnamon and pepper powder. Mix well everything and cook on low flame for 40 mins. Mash the mixture using paav bhaji masher or potato masher. Cook for another 30 mins. Add lemon juice and cook on low flame for another 20 mins till it reaches jam like consistency. To test, take a tbsp of jam and spread it on plate. It shouldn’t be watery. Switch off the flame and let the jam come to room temperature. Store in a sterilized jar or clean bottle. It sounds so healthy and interesting recipe.